May 24, 2014 by The Junkie 2 comments on "Russian Phrases: How To Introduce Yourself in Russian"
The first thing any beginner Russian learner needs is an introduction. As in, who are you? Where are you from? Why are you learning Russian and why should anyone care? You should be able to say that in Russian. You will learn how to introduce yourself in Russian easily and learn TONS here. Do you want to listen to native speakers introduce themselves? 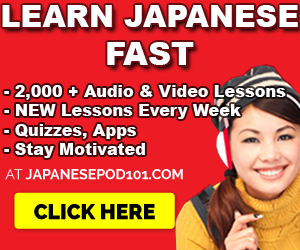 Then listen to this Audio Lesson (provided by RussianPod101.com – a Russian Language Program – click here to get more lessons) to hear the native pronunciation. Just press the play button on the player below. Top 25 Russian Questions You Need to Know S1 #1 – What’s your name in Russian? Below is the most important phrase of the audio lesson. Remember it. Меня зовут (insert your name here). Menya zavoot (insert your name here). My name is (insert your name here). Now, how would you introduce yourself in Russian? Take a look at the 6 lines below. You will learn how to say them in Russian. This is your Russian introduction or elevator pitch that you’ll use over and over. Hello, My name is …… What’s your name? Here’s how you introduce yourself in Russian. We’ll go from 1-6 and translate it so you can easily have something to say in Russian and start talking ASAP. Здравствуйте, Меня зовут (name). A как вас зовут? Zdrastvuyte, menya zavut (name). A kak vas zavut? Example: Zdrastvuyte, menya zavut Bob. A kak vas zavut? Don’t worry too much about saying your name in Russian pronunciation. “I am from …….” in Russian. Example: Я из США. Ya iz Sa-Shi-Ah. I am from America. США is the Russian abbreviation for the United States of America. Example. Мне двадцать пять лет. Mne dvadsat pyat let. I am 25 years old. “I am a (student/occupation)” in Russian. Example: Я – студент. Ya stoo-dent. I am a student. Я изучаю русский потому что (reason). Ya izuchayu russkiy potomu shto (reason). нравится. Ya izuchayu russkiy potomu shto mne yazik nravitsa. I’m learning Russian because I like the language. Я изучаю русский язык уже (duration). Ya izuchayu russkiy yazik uzhe (duration). Example: Я изучаю русский язык уже 2 года. Ya izuchayu russkiy yazik uzhe dva goda. I’ve been learning Russian for 2 years already. Here’s your Russian self introduction script you might want to use. Zdrastvuyte, menya zavut Bob. Mne dvadsat pyat let. Ya stoo-dent. Ya izuchayu russkiy potomu shto mne yazik nravitsa. Ya izuchayu russkiy yazik uzhe dva goda. Just substitute the red parts with your details. This is a simple and easy way to introduce yourself in Russian. This next section is super useful. You will learn the many ways to introduce and greet in Russian with “example conversations.” Please feel free to print this so that you can use it later. In the example below, two friends, Andrey and Max, greet each other in Russian. A: Hi, Max! How are you! What are you doing? Want to to the movies with us today? You will meet my friend, Alena. M: What’s up, Andrey! Today I have a day off, so I’ll go with pleasure! I already know Alena. We met at the institute. A: Excellent! Now you can get to know each other better. See you! А: Привет, Макс! Как дела! Что делаешь? Пойдешь сегодня с нами в кино? Познакомишься с моей подругой, Аленой. М: Здарова, Андрей! Сегодня у меня выходной, с удовольствием пойду! Я уже знаком с Аленой. Мы виделись в институте. А: Отлично! Теперь Вы сможете узнать друга получше. До встречи! A: Privet, Maks! Kak dela! Chto delayesh? Poydesh sevodnya s nami v kino? Poznakomishsya s moyey podrugoy, Alenoy. M: Zdarova, Andrey! Segodnya u menya vykhodnoy, s udovol’stviyem poydu! Ya uzhe znakom s Alenoy. My videlis’ v institute. A: Otlichno! Teper’ Vi smozhete uznat’ druga poluchshe. Do vstrechi! Below, you will see a guy named Andrey introduce himself to a lady named Evgeniya. Evgeniya: Hello, what’s your name? Andrey: Hello! Let me introduce myself. My name is Andrey. I am 25 years old. I am a student! Evgeniya: Nice to meet you, Andrew! Where are you from? Andrey: I’m from Moscow! What’s your name? Is this your first time here? Evgeniya: My name is Evgeniya! I’m a journalist. Yes, here for the first time! Andrey: Where did you stay? Evgeniya: I stayed at the hotel “Russia”. Tell me about yourself, Andrew! Andrey: I’m a very cheerful person. I like to do sports! Now I’m studying and working as a fitness trainer! In the future I plan to open my own fitness center. I love to read books. I believe that the most important thing in life is a positive attitude! Evgeniya: You are very nice to talk to, Andrey! Thank you! Евгения: Здравствуйте, как вас зовут? Андрей: Здравствуйте, позвольте мне представиться. Меня зовут Андрей. Мне 25 лет. Я студент! Евгения: Очень приятно, Андрей! Откуда вы? Андрей: Я из Москвы! А Вас как зовут? А Вы здесь в первый раз? Евгения: Моё имя Евгения! Я журналистка. Да, я здесь впервые! Евгения: Я остановилась в отеле Россия. Расскажите лучше о себе, Андрей! Андрей: Я очень веселый человек. Люблю заниматься спортом! Сейчас я учусь и работаю фитнесс тренером! В будущем планирую открыть свой собственный фитнес центр. Очень люблю читать книги. Я считаю, что главное в жизни – это позитивный настрой! Евгения: Вы очень милый собеседник, Андрей! Спасибо Вам! Evgeniya: Zdravstvuyte, kak vas zavut? Andrey: Zdravstvuyte, pozvol’te mne predstavit’sya. Menya zavut Andrey. Mne 25 let. Ya student! —Evgeniya: Ochen priyatno, Andrey! Otkuda vi? Andrey: Ya iz Moskvi! A Vas kak zavut? A Vi zdes’ v perviy raz? —Evgeniya: Moyo imya Evgeniya! Ya zhurnalistka. Da, ya zdes’ vperviye! Evgeniya: Ya ostanovilas’ v otele Rossiya. Rasskazhite luchshe o sebe, Andrey! Andrey: Ya ochen’ veseliy chelovek. Lyublyu zanimat’sya sportom! Seychas ya uchus’ i rabotayu fitness trenerom! V budushchem planiruyu otkrit’ svoy sobstvenniy fitnes tsentr. Ochen’ lyublyu chitat’ knigi. YA schitayu, chto glavnoye v zhizni – eto pozitivniy nastroy! Evgeniya: Vi ochen’ miliy sobesednik, Andrey! Spasibo Vam! Below is a formal Russian introduction between a businessman that wants to learn English and an English teacher. See if you can spot any Russian phrases. A: Good day! My name is Andrew! I am thirty-five years old. I’m a businessman, I want to learn English! What is the price of your services? M: Hello, Andrew! My name is Maxim. I’m an English teacher. I have been translating for more than 20 years. I can help you! The price depends on the level of your knowledge: from 1000 to 3000 dollars per course. A: It suits me. Tomorrow I’ll call you and we’ll discuss all the details, thanks! M: See you, Andrew1 А: Доброго времени суток! Меня зовут Андрей! Мне тридцать пять лет. Я бизнесмен, я хочу выучить английский! Какова цена Ваших услуг? М: Здравствуйте, Андрей! Мое имя Максим. Я учитель английского языка. Я занимаюсь переводом более 20 лет. Я могу Вам помочь! Цена зависит от уровня Ваших знаний: от 1000 до 3000 долларов за курс обучения. А: Мне подходит. Завтра я позвоню Вам и мы обсудим все детали, спасибо! М: До встречи, Андрей! A: Dobrogo vremeni sutok! Menya zavut Andrey! Mne tridtsat’ pyat’ let. Ya biznesmen, ya hochu vyuchit’ angliyskiy! Kakova cena Vashih uslug? M: Zdravstvuyte, Andrey! Moye imya Maksim. Ya uchitel’ angliyskogo yazyka. Ya zanimayus’ perevodom boleye 20 let. Ya mogu Vam pomoch’! Tsena zavisit ot urovnya Vashih znaniy: ot 1000 do 3000 dollarov za kurs obucheniya. A: Mne podhodit. Zavtra ya pozvonyu Vam i mi obsudim vse detali, spasibo! In this next example, you will learn a “professional Russian introduction.” In other words, this is formal and is used in a business email. D: Hello, Andrey! My name is Dmitry. I’m a professional translator. Have you received a letter from Catherine? Please write when we can get started! A: Hello, Dmitry! Thanks for the quick response! Yes, I received an email! I got acquainted with the details. We can start tomorrow. Andrei Д: Доброго времени суток, Андрей! Меня зовут Дмитрий. Я профессиональный переводчик. Вы получили письмо от Екатерины? Напишите, пожалуйста, когда мы сможем начать работу! А: Здравствуйте, Дмитрий! Спасибо за быстрый ответ! Да, я получил письмо по электронной почте! Я ознакомился с деталями. Мы можем начать завтра. Андрей D: Dobrogo vremeni sutok, Andrey! Menya zovut Dmitriy. Ya professional’nyy perevodchik. Vy poluchili pis’mo ot Yekateriny? Napishite, pozhaluysta, kogda my smozhem nachat’ rabotu! Ready for a review? Here are some Russian phrases that will be useful for Russian introductions. You are learning to speak and understand Russian, right? And you want to be understood by Russians, right? Good. Just like you, most learners out there, above all, want to speak and be understood in Russian. Learn to introduce yourself in Russian and you’ve got 1/3rd of a Russian conversation squared away. The rest are topics of interest and closing greetings. Now, you know how to introduce yourself in Russian! Leave me a comment and tell me what you think. Or better, yet, introduce yourself! P.S. 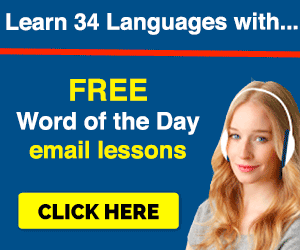 Want to learn to Russian with effective lessons? 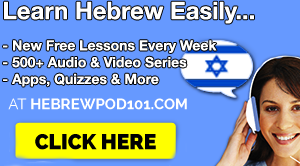 Sign up for free at RussianPod101 and start learning and speaking Russian. I recommend them as a teacher and a learner. 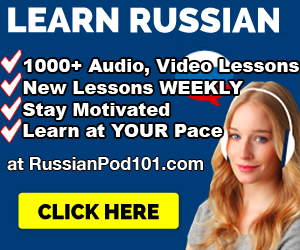 Click here to sign up for free and learn Russian at RussianPod101!